The Grand Strand Beaches, Horry and Georgetown Counties. I work on a reward basis. If the item is found you pay what my services were worth to you for the lost and found item. If the Item is not found there will be a $30. Call Out Fee. This is to cover my expenses of fuel, batteries, etc.. All searches are different. There may be additional cost factors. Insurance and Estate Searches are negotiated. Area beaches, Shallow Water 4’, Parks, Yards, Playing Fields / Playgrounds, Estate Grounds. If it’s precious metal, I go! A long time resident of the Grand Strand. If it’s outside then I’m at home. I am an avid outdoorsman. With help from my wife we raised three great boys. I have wanted to metal detect since I was a small child, and finally got into the hobby about 5 years ago. I have “State of the Art” equipment, and I know how to use it. 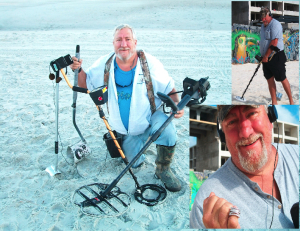 Don’t rent a metal detector when you can rent me. Matt, thank you for bringing such joy to my mother and me. 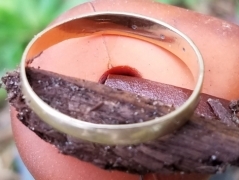 We will never forget what you did for us in finding my father’s ring. We are sure he is smiling from above, indeed. Also, we’re delighted that you’re helping the wonderful kids at Shriners’ Hospital. Wishing you many blessings in your continued work! MATT WAS AWESOME! The minute he found my husbands ring, I ran and gave him the biggest hug! He found it in a whopping 13 minutes after we had been searching for 2 hours! We were not disappointed! 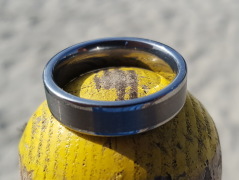 Thank you so much for helping us find his ring so it didn’t ruin our vacation LOL! Anyone who loses a ring, look up The Ring Finders!!! After losing my ring last Monday, I was devastated but also so mad at myself!! I searched with my neighbors for hours that evening and we had no luck. 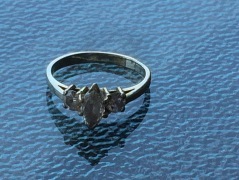 On Tuesday evening I decided to look at the lost and found through craigslist and came across the Ring Finders. Mr. Fry was so nice and willing to walk miles to try and locate my ring. He was also very willing to let me join in the search, even though I had never worked a metal detector before. While we searched and searched for almost 3 hours I can honestly say that I was about to give up hope. I was getting so tired, hot and exhausted. It was at that moment Mr. Fry walked across the street to where I was, came up to me (serious as can be) he asked if I thought we had given it the all American try (in my head I was thinking, this guy has had enough and he is ready to go home) he then asked if I believed in miracles and held my ring up!! I started shaking and had instant tears rolling down my cheeks!! Of course I hugged him and thank him over and over. It had been missing for 5 days with tons of rain!! I was sure that my ring was gone forever, thank god I was wrong. I always say that I believe there are Angels among us and Mr. Fry is definitely one of them.